I must say that I'm enjoying rereading the Book of the Fallen. As with many a book that captures your attention, rereading it can bring out whole new levels of meaning and interpretation. Now, I'm not going to claim any great or groundbreaking philosophical weight for any of Erikson's work but he does attempt a certain "seriousness of purpose" (using Daniel Mendelsohn's criterion for good literature - see my review: http://www.goodreads.com/book/show/2187297.How_Beautiful_It_Is_and_How_Easily_It_Can_Be_Broken_Essays). He's not as polished or subtle as Ursula Le Guin, say, but his characters are believably complex and even the best of intentions can go horribly awry (in that last point, I have in mind Kilava's well meant attempt to save the Jaghut children in the Prologue to Memories of Ice). 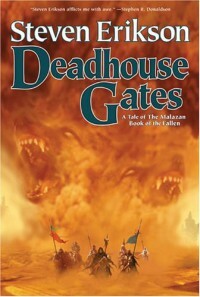 In Deadhouse Gates, Erikson abandons most of the characters from Gardens to take us to the continent of Seven Cities and the Whirlwind's long awaited rebellion. From Gardens, we follow Kalam, Fiddler, Crokus & Apsalar as they attempt to return Apsalar to her home in Itko Kan. Kalam & Fiddler also have the ulterior motive of returning to the capital to assassinate Laseen, the Empress. In Seven Cities, Kalam is soon separated from his companions - he sets off alone to awaken the Whirlwind while Fiddler et al. find themselves caught up in Shadowthrone's plots and the fever dreams of Soletaken Ascendancy. Two new plotlines are introduced: The first is the travails of Felisin, Ganoes Paran's youngest sister. The family has been disgraced by his betrayal and in another one of the Empire's periodic culls of the nobility, Tavore sacrifices her to appease the Empress (there's a complicated subterfuge going on, however, that Felisin (unfortunately) is unaware of until too late - the upshot is that Tavore is not quite the monster one might think). Felisin is sent to the Otataral mines on Seven Cities. Ironically, she winds up becoming the prophesied High Priestess of the Whirlwind, Sha'ik, eventually coming face to face with Tavore, the Empress' new Adjunct, in House of Chains. The second is the Chain of Dogs - the crossing of the continent by the ravaged Seventh Army and their Wickan allies, herding 50,000 civilian refugees in the face of constant assault by the blood-mad armies of the Whirlwind. Erikson has a way of including a least one apocalyptic struggle in each book of the series and the Chain is this one's. It's also, for me, the best and most affecting because I like its narrator, Duiker, the Imperial Historian, so much, as well as Coltaine, the Army's new Fist (general), a Wickan chief who originally led those tribes' resistance to Imperial expansion on Quon Tali.